As a variant of the ordinary urothelial carcinoma (UC), UC with peculiar gland-like lumina (GLL) has been rarely reported [1-4]. In some cases, adenocarcinoma was also detected in patients with ordinary UC [5,6]. The UC cancer cells at times have been found to secrete mucin in the intracytoplasmic or the intercellular areas [4,7-10]. However, no secretory materials have been observed in the GLL areas . We studied a case of UC with a peculiar GLL, exhibiting a smooth morphological transition from one to the other. Tumor cells were arranged in a circular or a meshwork pattern, with no observable glandular spaces. Moreover, immunohistochemical staining demonstrated similar staining patterns of both the UC and the GLL areas, which implied that the GLL areas were the morphological variants of the ordinary UC. We found no differences in the patient’s prognosis between ordinary UC and the UC with GLL . Here, we present the immunohistochemical comparisons of both the UC and the GLL components of the reported case. The patient was a Japanese woman in her mid-seventies who showed macroscopic hematuria and had undergone laparoscopic resection of the left kidney and the left adrenal gland. The renal pelvic tumor was found with surface papillary growth, and the tumor cells had proliferated within the pelvic cavity showing a clear border (Fig 1). The excised left kidney and the adrenal gland were fixed in 10% formalin solution and were then embedded in paraffin. Dewaxed sections were obtained and stained with hematoxylin and eosin (HE), mucicarmine and alcian blue stains, and diastase-PAS reaction. Immunohistochemical staining was performed as described previously [11,12] by using labeled streptavidin-biotin complex (LSABC) 2 kit/horseradish peroxidase (HRP) (DakoCytomation, Kyoto, Japan) with diaminobenzidine as the substrate; the antibodies are listed in Table 1. Figure 1: Paraffin section of the tumor following fixation. Note the intrapelvic tumor with a clear margin (arrows). Table 1: Antibodies used in this study (Be careful on red characters in the Table). A written informed consent was obtained from the patient, and her identity has been protected. The tumor proliferated within the thick fibrous stalk attached to the renal pelvic wall, with the cancer cells proliferating in the form of a solid sheet, showing ordinary papillary UC associated with peculiar trabecular or meshwork pattern in the GLL area (Fig. 2 arrows). The GLL area made up almost 30–40% of the entire cancer tissue. In the part of the UC, which was grade 2 in nature, the cancer cells proliferated in the form of a solid sheet and/or peculiar meshwork or trabecular pattern corresponding to the GLL (Fig. 3), with no mitotic figures. 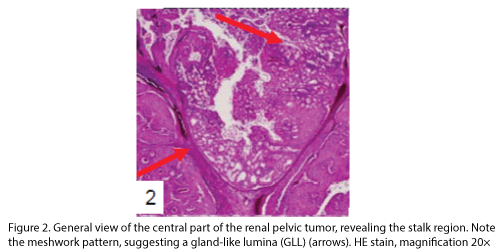 At a higher magnification, the GLL areas did not show real lumina, but some contained small blood vessels or edematous connective tissues (Fig. 4). Morphologically, both UC and GLL areas often transitioned smoothly across each other (Figs. 3 and 4). Mucicarmine and alcian blue staining and PAS diastase staining showed no positively stained materials in the tumor cells. As shown in Table 2, immunohistochemically, the cancer cells of both UC and GLL areas were diffusely positive for AE1/AE3 and CK7 (Fig. 5), but not CK20 (Fig. 6). Some of the cancer cells were stained for p63 (Fig. 7), CAM5.2, MA903, and KL- 6, albeit weakly. MA902, CEA, and HER 2 staining was negative. Markers of neuroendocrine differentiation, such as chromogranin A, synaptophysin, and NSE, were all negative, including for the GLL areas. Type IV collagen failed to demonstrate linear positivity around the basement membranes in the GLL areas, but showed circular positivity at regions surrounding the blood vessels. Interestingly, proliferative activity of the cancer cells was much higher in UC than in the GLL areas, as revealed by the MIB-1 stain (Fig. 8). Specifically, the UC cancer cells showed approximately 5% positivity with MIB-1 (Fig. 8, lower part), but those in the GLL areas were mostly negative (Fig. 8, upper part). UC with GLL has been rarely described as a variant of ordinary UC [1-4,6], but the evidence of divergent differentiation of UC has been reported previously (4, 6). In addition to the adenocarcinoma of the urinary tract, some cases have shown glandular lumina, which contained mucinophilic materials [7-9]. In fact, mucin secretion has been observed in the intracytoplasmic and the intercellular lumina in UC [1,7]. In the present case, GLL areas showed trabecular meshwork pattern with smooth transition to solid UC, without producing any mucinous materials. 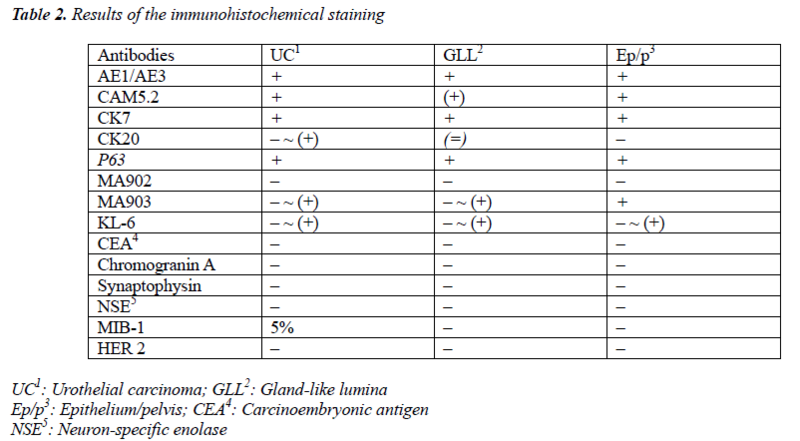 Immunohistochemically, both ordinary UC and the one with GLL demonstrated similar staining with various types of cytokeratins and other antibodies as shown in Table 2. Diffuse positive staining for CK7, an important marker of adenocarcinoma in differentiating the metastasizing colon cancer from urinary tract cancer , was observed, as shown in Fig 5, in keeping with the findings of previous studies [3,4], while uneven and weak staining results were obtained for CK20, including at the negative parts, as indicated in Fig. 6. Regarding CK20, positive [3,4] and negative  staining for UC with GLL were observed as previously reported. It has also been reported that HER 2 was positive in both UC and GLL in 1 case , but these findings were not constant in GLL . In contrast, our case was completely negative for HER2 in both UC and GLL components. Table 2: Results of the immunohistochemical staining. Interestingly, the proliferative activity of the GLL areas was much lower than that of ordinary UC, as shown in Fig. 8. These results indicate that the prognosis of a case of UC with GLL is similar to that of an ordinary UC, with no relationship with the presence of GLL areas . We suggest that additional immunohistochemical data should be collected by studying cases of UC with GLL in the future. We are grateful for the secretarial assistance of Mrs. K. Matsushita and Ms. K. Takasuka. 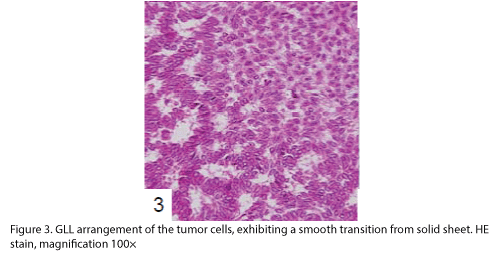 Tamboli P, Mohsin SK, Hailemariam S, Amin MB:Colonic adenocarcinoma metastatic to the urinary tract versus primary tumors of the urinary tract with glandular differentiation:a report of 7 cases and investigation using a limited immunohistochemical panel. Arch Pathol Lab Med 2002; 126:1057-1063. Fernandez-Flores A, Manzarbeitia F, Alonso JG:Expression of c-erb-2 and cytokeratin 7 and 20 in urothelial carcinoma with gland-like lumina. Ann Diagn Pathol 2003; 7:281-284. Alvarado-Cabrero I, Perez-Montiel D, Hes O;Multicystic urothelial carcinoma of the bladder with gland-like lumina and with signet ring cells.A case report. Diagn Pathol 2008; 3:36. Young RH, Eble JN:Unusual forms of carcinoma of the urinary bladder. Hum Pathol 1991; 22:948-965. Shanks JH, Iczkowski KA:Divergent differentiation in urothelial carcinoma and other bladder cancer subtypes with selected mimics. Histopathology 2009; 54:885-900. Delladetsima J, Antonakopoulos GN, Dapolla V, Kittas C;Intraepithelial lumina in urothelial bladder neoplasms. A histochemical, immunohistochemical and electron microscopy study. APMIS 1989; 97:406-412. Donhuijsen K, Schmitt U, Richter J, Leder LD:Mucoid cytoplasmic inclusions in urothelial carcinomas. Hum Pathol 1992; 23:860-864. Walsh MD, Hohn BG, Thong W, Devine PL, Gardiner RA, Samaratunga ML, McGuckin MA:Mucin expression by transitional cell carcinomas of the bladder. Br J Urol 1994; 73:256-262. Epstein JI, Amin MB, Reuter VE:Bladder biopsy interpretation. p.263, Lippincott Williams and Wilkins, Philadelphia, USA, 2004. Ohtsuki Y, Kuroda N, Umeoka T, Watanabe R, Ochi K, Okada Y, Lee G-H, Furihata M: KL-6 is another useful marker in assessing a micropapillary pattern in carcinomas of the breast and urinary bladder, but not the colon. Med Mol Morphol 2009; 42:123-127. Ohtsuki Y, Fukumoto T, Okada Y, Teratani Y, Hayashi Y, Lee G-H, Furihata M: Immunohistochemical and ultrastructural characterization of the signet-ring cell carcinoma component in a case of urothelial carcinoma of the urinary bladder. Med Mol Morphol 2010; 43:96-101.